Yue Fei seems to have been home for a long time…his sons are a lot older now. Haha, he’s such a strict father. He makes them do wall sits (without the wall) while he works in the fields. The boys are saved from further physical tests when Bro Squad rides up. They have some bro talk over dinner. Yue Fei gives some of his opinions on military strategy. This is the first time Yue Fei uses his nickname, Peng Ju, in conversation. This is a little strange to me, because this visiting official doesn’t seem to be particularly close to him…Yue Fei talks about how he’s willing to sacrifice himself for his country, and Xiao E drops a plate of food. Yue Fei checks up on her, and there’s some cuddling. Yay, that’s all I need. Xiao E tells him not to worry about her. She’s not hoping or even trying to keep him at home. She understands that his ambitions lie outside of the home. Aw, Xiao E says she doesn’t have many abilities..besides becoming Yue Fei’s wife. Yue Fei then goes to visit the other most important woman in his life: his mom. He tells her that he’s going to leave with Official Zhang the next day. 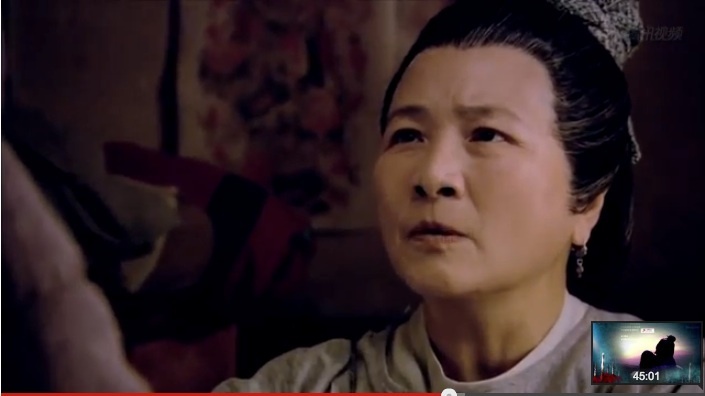 Yue Fei’s mom is extremely understanding, and only worries about Xiao E’s feelings. Aw, best in-law relationship ever. Yue Fei hands his mom money. She tells him that she and Xiao E never wanted any money. They only want him. She gives him some words of wisdom about evaluating the Emperor that he’s pledging his life for. Smart lady. I wish we had more background on them…how did they all come to be so educated?! Since tattoos are in style, Yue Fei’s mom tattoos some words onto his back: 精忠报国 (basically meaning that he’ll loyally serve his country). This reminds me of the scene in Water Margins where Li Shi Shi tattoos Yan Qing’s back. Xiao E watches in the back of the room with tears in her eyes. Bro Squad also comes in to witness the scene…and also Yue Fei’s kids. Is this meant to be so public? I think Huang Xiao Ming is just looking for excuses to take off his shirt now…not that I’m complaining. This scene has gone on for almost ten minutes now…. 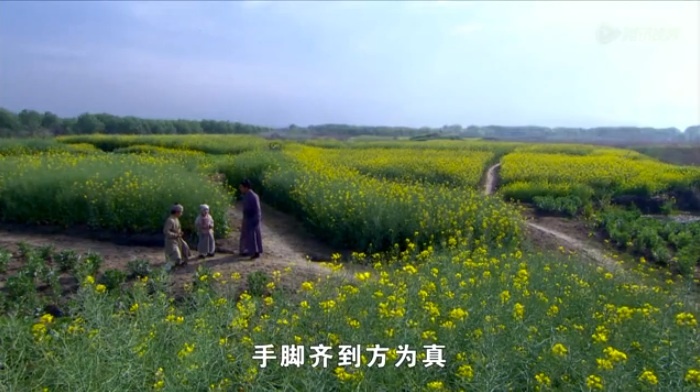 4th Jin Prince meets with Zhao Gou’s mom. She schools him on the suffering of citizens. Should’ve taught your son better. Maybe he wouldn’t end up like he is now. Call me out on being girly and biased, but I’ve become so uninterested with the scenes discussing military strategy. 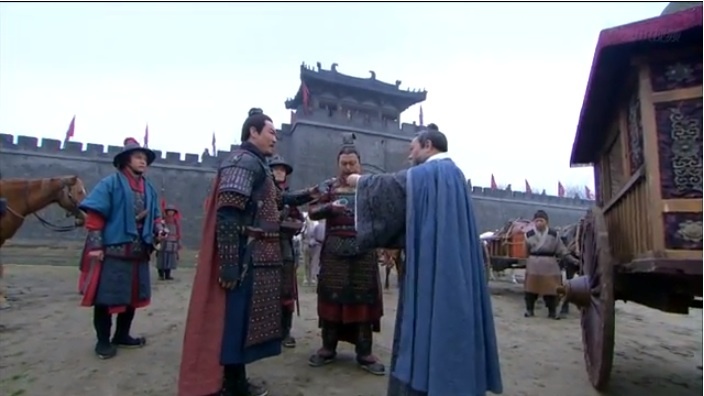 I used to live on these scenes when Zhuge Liang was throwing out his opinions, but I can’t seem to stand it in this drama. 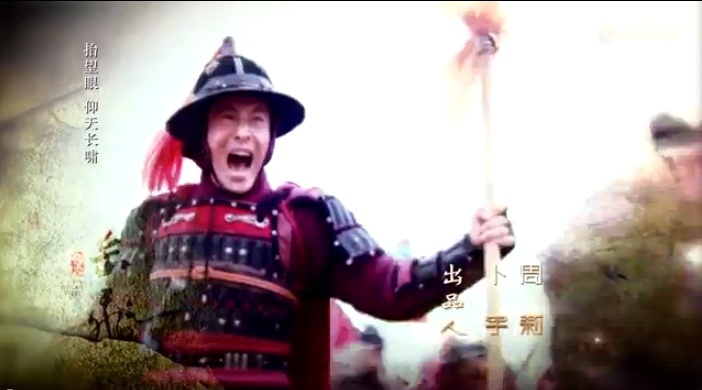 Yue Fei is a military general…more action, less talking! He’s not even supposed to be good at all this smart plotting and planning. Otherwise, I’m going to find it hard to believe the circumstances around his fall. As a viewer, you see almost none of his weaknesses. If he just falls as a perfect human being, I will be extremely frustrated at the ending. I love that Yue Fei’s family is so supportive of him. No negativity at all. From his littler brother, who blindly followed his brother onto the battlefield and even dying to save his idolized older brother, to his mom and wife, who send him off happily. This entry was posted in Chinese Dramas, Culture, Drama Recaps/Reviews and tagged 精忠岳飞, Episode 19, Huang Xiao Ming, Jing Zhong Yue Fei, Patriot Yue Fei, Recap. Bookmark the permalink.